The legend 4 is epilady's newest full-size rechargeable epilator allows you to remove hair all over your body for up to 4-6 weeks. 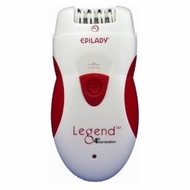 the legend 4 is the latest in the line of epilady's best-selling legend epilators. it can be used corded or cordless with the same power and efficiency either way. the perfect angle guide puts the user in the perfect angle for epilation for great results the first time. removes hair safely from the arms legs underarms bikini and face (do not use around the eyes). smooth quiet and efficient the legend 4 is our best epilator yet! kit includes adapter perfect angle guide storage pouch cleaning brush and instruction manual. one year manufacturer’s warranty.